So one day I was messing about on social media and a post popped up from @trzewik from Portal Games asking what we were playing that weekend. So I responded by naming a few boardgames and that I would be baking cupcakes. I even posted a picture of the cupcakes later in the day. Mike pointed out this was all a bit mean as none of the games mentioned were by Portal Games. In fact looking at our games shelf I noticed we had none made by Portal Games. So I decided to remedy that and purchased Tides of Time the very next time I saw it. Then it stayed in the wrapper on the shelf and gathered dust, oops. The players are dealt a hand of 5 cards and draft one card at a time, passing their hands between them after each selection. 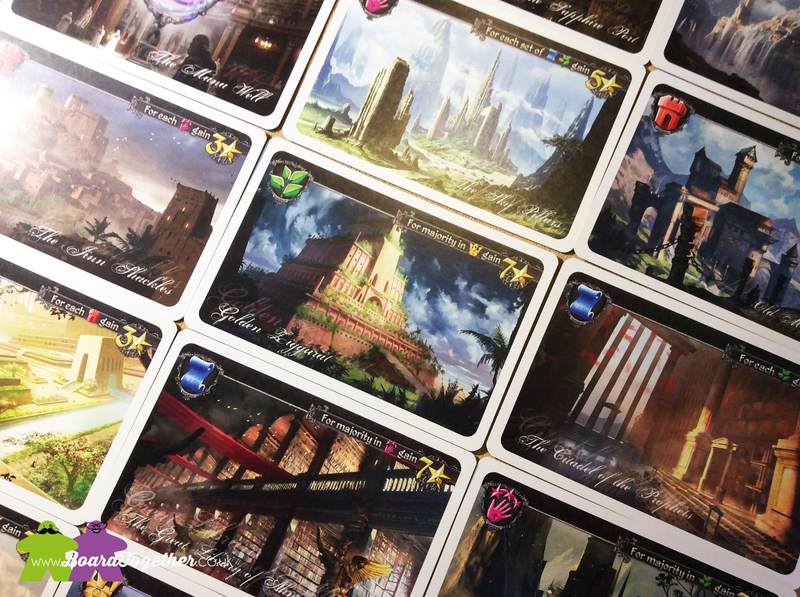 Each card has a suit as well as a unique scoring rule that may score the player points based on the suits of cards drafted. 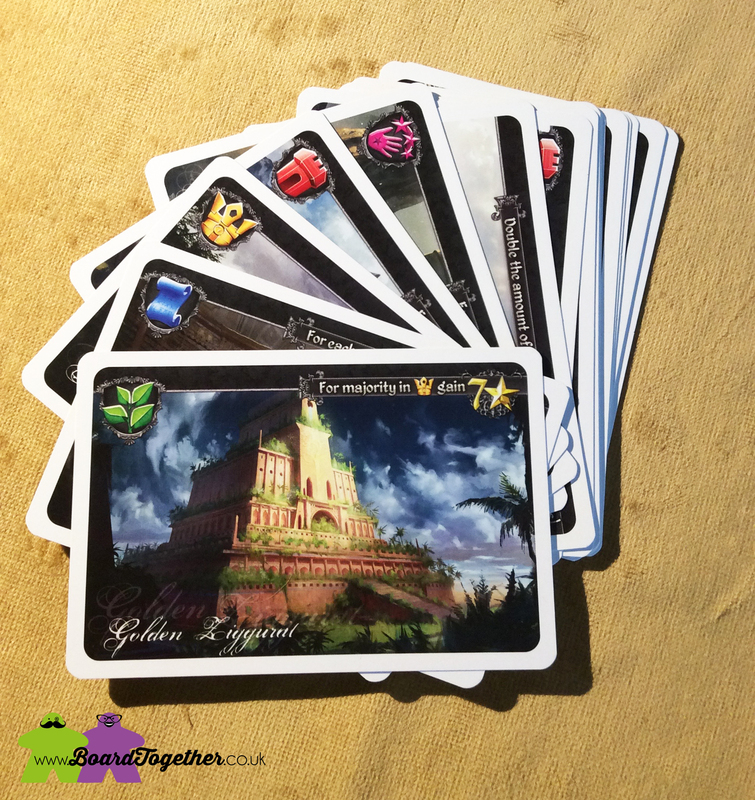 At the end of each round, the players count their kingdoms score, select one card to keep for future rounds as a Relic of the Past, players discard one card back to the box and draw two more cards to make up a hand of 5 again. After three rounds, the player with the most points, meaning a prosperous kingdom, wins. Easy peasy lemon squeezy. In fact after our first game we were a little disappointed. Was this it? 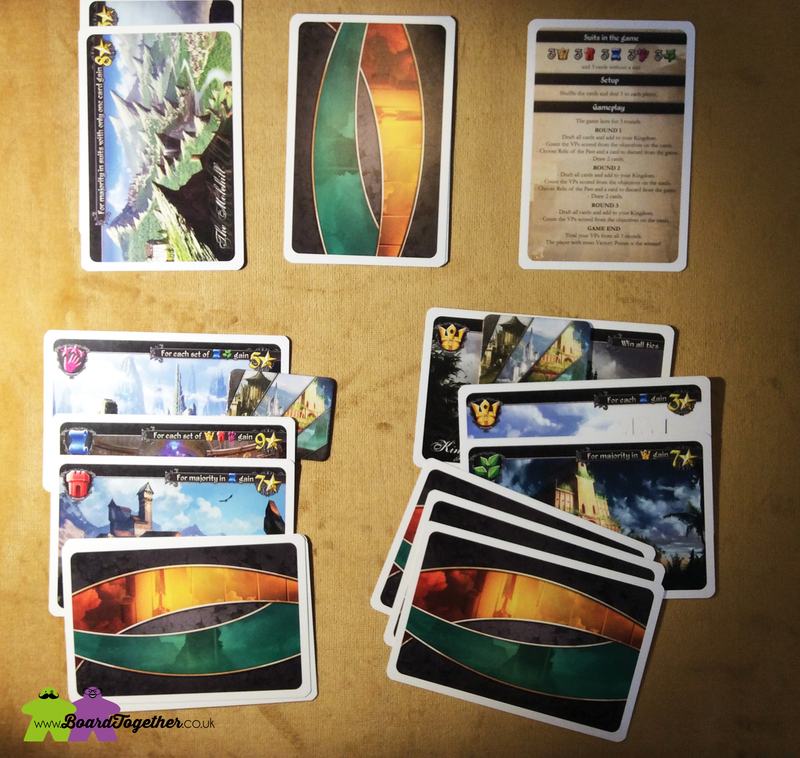 It reminded us a lot of Citadels and Sushi Go, two games we really enjoy playing. The box says it should take 20mins, we have never taken 10mins, not that this is a bad thing. We play it weekdays and after a long day at work, you want to play, but nothing that takes up a lot of time. Tides of Time is a 2 player game. We find we play these games very little. Not sure why, we love playing games as a couple, yet we gravitate away from just two player games. Might be because we like to introduce other people to games and you can’t really do that with a two player game. We have Star Realms and Patchwork, two player games we enjoy, but they spend very little time on the table being played. Ah well, back to the mind melt that is Colt Express two player . . . The game contains 18 cards, we are worried about replayability, will it get boring when we know all the cards and what we can do with them by heart? Maybe, then again maybe knowing the cards means we can plan better and start card counting and second guessing what the other person will do. In fact this game has got a little better each time we play and know what we are doing, so far. This may change after a lot of plays. 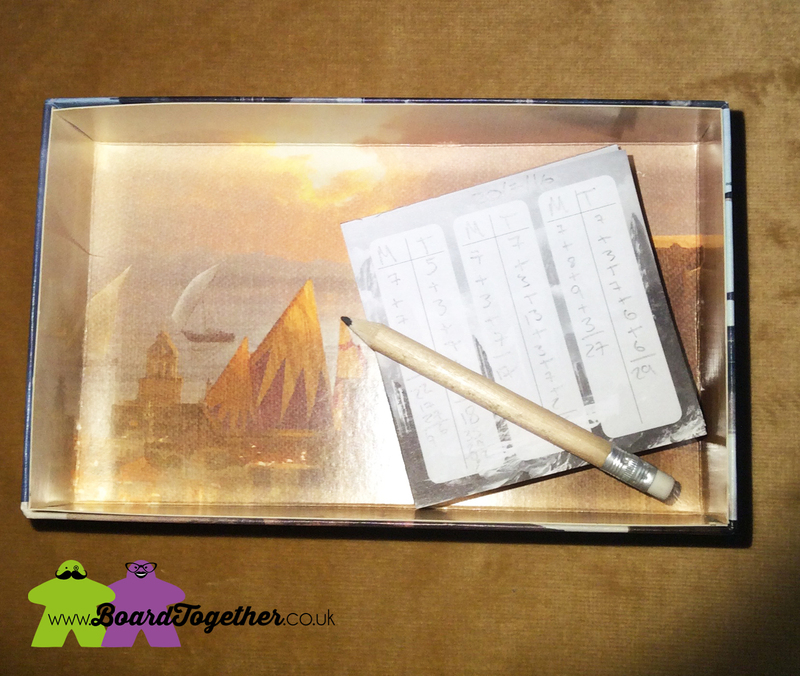 Scoring, easy enough to do with the little pencil and pad included. But boy is it strange. You can have a round where you score nothing and then completely trounce the other player in the next round. It keeps the game interesting and tense, you can’t bet on being the loser or the winner until the very last second. Mike has taken to nabbing the “Win All Ties” card as soon as possible and racks up the points with that. I like the long game of set collection if they pop up early I keep them for the last round and score some epic points after getting none in the first round!! 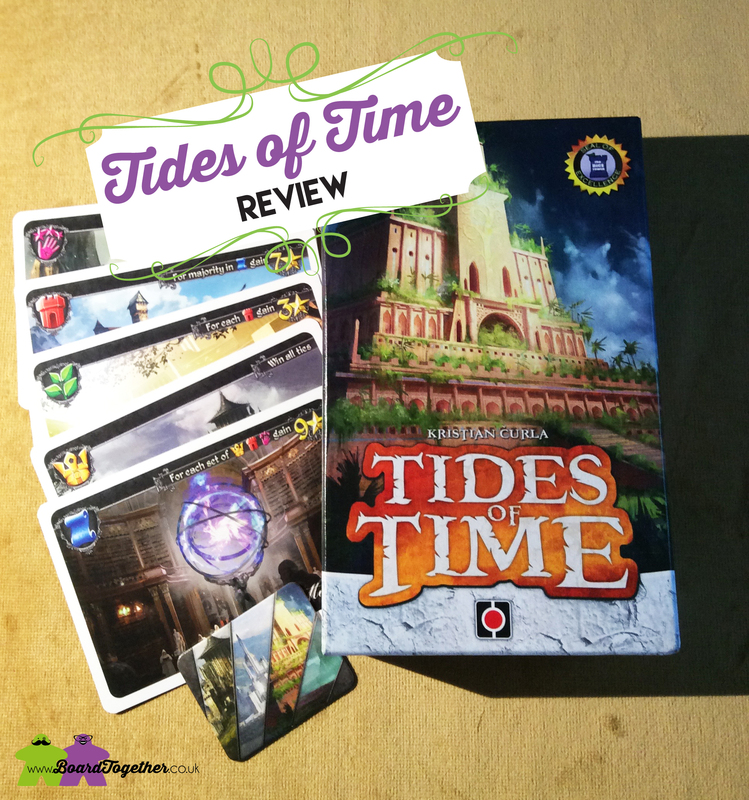 Tides of Time needs a few plays to really appreciate the depth of strategy for a game with 18 cards. Choosing which cards to keep as relics and which to discard can make or break your overall game. Swapping the hands keeps you on your toes as you have to constantly change your plan and make the best of what you have. The artwork for Tides of Time is beautiful, seriously, a lot of love went into these pictures. It takes up very little shelf space, in a small box and does not need a huge table when played. I am not sure we will play this all the time, but we will check it out when we want a quick game that has just enough strategy when we are tired and don’t want to play, but feel the day is wasted if we don’t play a boardgame!